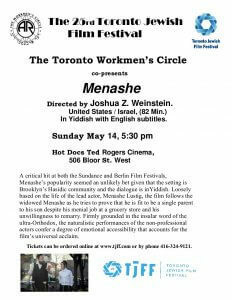 The Toronto Workmen's Circle is co-presenting the acclaimed Yiddish film "Menashe" at this year's Toronto Jewish film Festival. The film will be screened on Sunday May 14. 2017, at 5:40 pm at the Hot Docs Red Rogers Cinema, 506 Bloor Street.